Cosmic rays are atomic nuclei that travel through space at speeds close to that of light. Low-energy cosmic rays come from the Sun or from our own Galaxy, but the origin of the highest-energy particles has been the subject of debate ever since they were first discovered fifty years ago: do they come from our Galaxy or from distant extragalactic objects? The question has now been settled by studying 30 000 cosmic-ray particles with energies a million times greater than those of the protons accelerated in the LHC . They were detected from 2004 to 2016 at the largest cosmic ray observatory ever built, the Pierre Auger Observatory in Argentina. 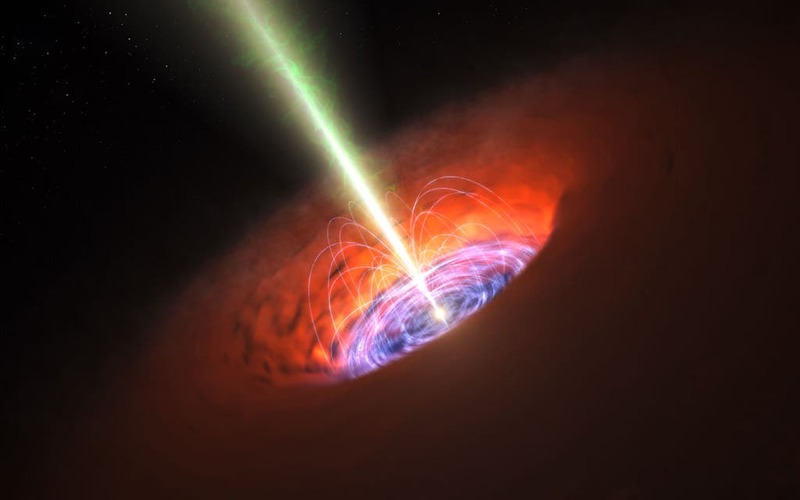 Analysis of the arrival directions of the particles showed that at such energies the flux of cosmic rays coming from a region of the sky located 120 degrees from the galactic center is approximately 6% higher than if the flux were perfectly uniform. This direction cannot be associated with potential sources in either the galactic plane or galactic center, providing the first convincing evidence that these cosmic rays have an extragalactic origin. The flux of these very high-energy cosmic rays (exceeding 2 joules) is about one particle per square kilometer per year . When the cosmic rays collide with molecules in the upper atmosphere, they create cascades of over 10 billion secondary particles, known as air showers, which can cover an area exceeding 40 square kilometers by the time they reach the ground. The Pierre Auger Observatory detects some of these secondary particles (electrons, photons and muons) by means of an array of 1 600 detectors, i.e. tanks of pure water spaced 1.5 kilometers apart and covering 3 000 square kilometers in the Argentinian pampas, an area slightly larger than Luxembourg. By comparing the arrival times of particles at the different detectors it is possible to determine where the cosmic ray particle that produced the air shower came from. This discovery clearly indicates an extragalactic origin for these cosmic rays, since there is a probability of only one in five million that the pattern observed in the sky is due to chance. However, the study has not yet succeeded in locating the sources precisely. This is because the region where cosmic rays are brightest covers a large part of the sky, where the number of galaxies is relatively high. In addition, our Galaxy's magnetic field deflects the paths of these charged particles, making it more difficult to locate their sources. Some cosmic rays have even higher energies than those focused on in this survey. They have the disadvantage of being even more unusual, but also the advantage that they are not as deflected by the magnetic field of our own Galaxy. Their direction of arrival may therefore more accurately indicate the region where they were produced. In 2007, an earlier study pointed to a correlation between active galactic nuclei and the arrival directions of the highest-energy cosmic rays then detected , but this correlation subsequently turned out to be not very significant. Research is currently being carried out on a much larger sample of ultrahigh-energy cosmic rays, and may provide some answers. At the same time, an upgrade program is underway at the Pierre Auger Observatory, which should make it easier to identify the sources. 400 scientists from 18 countries take part in the Pierre Auger Collaboration, which develops and runs the observatory of the same name.